Character » Black Bolt appears in 1292 issues. The king of the Inhumans, Black Bolt is cursed and blessed with a quasi-sonic voice. He must remain forever silent, for with the slightest whisper he can destroy cities, and with the loudest screams he can level continents. NOTE: This page will be under heavy revision over next couple weeks. It's a work in progress as I go through as many Black Bolt appearances as I can. Thank you for your patience. @green_skaar: I'll try to have majority of my scans uploaded tomorrow. This is awesome! Thanks, a proper respect thread for BB has been long overdue. As noted this is a work in progress, so if you have other good feats feel free to include them and their source (if you have them). Going to put up some of his "heavy weight" battles too with Gladiator, Hulk and Thor in the near future as well. Matter manipulation to quickly melt the ice and blow a hole through the rocks. (Last 5 scans) goes on a rampage, blows through walls, disintegrates weapons, and manipulates Maximus's mind. I uploaded some of my scans, I'll try to get the rest of them uploaded in the next few days. Also, I wasn't sure how to properly add them to your original post so I made my own post instead. Hope thats ok.
Good job! I love Black Bolt, he's a very cool character. Black Bolt likes your plethora of scans showcasing his awesomeness! Black Bolt is scared, he sees a clone of himself!!! I'll have plenty of time over the holiday break to add them to the OP, I want them all in one spot. Thank you for the additions. This is everything I've ever read about Black Bolt compiled together. Black Bolt possesses powers by virtue of being a member of the Inhuman race, and through exposure to the Terrigen Mists while still in his mother’s womb. Ambient Particle & Electron Harnessing: Black Bolt's primary superhuman ability is the power to harness electrons. The speech center of his brain contains a unique organic mechanism that's able to generate an unknown particle that interacts with the electrons he absorbs to create certain phenomena that are determined by his mental control. Quasi-Sonic Scream: Black Bolt's most devastating offensive weapon, and one of these phenomena based upon the particle interaction, is his actual voice. A whisper can level a city, cause distant dormant volcanoes to become active once more, shake entire continents apart and generate tremors on the far side of the planet. A hypersonic shout has been said to generate enough force to destroy planets. Due to the constant and extreme danger posed by his voice, he has undergone rigorous mental training to prevent himself from uttering even the smallest sound, even while asleep because even the smallest sigh directed towards most all individuals, even those possessing great physical attributes, is enough to destroy them as he has been able to beat the Hulk more than once. Due to the fear of speaking while sleeping, Black Bolt practices a form of meditation, which may also help to enhance his abilities. Recently it has been shown that Black Bolt's scream is tied into his emotions, especially anger. This in turn would mean that the power of his scream would depend on his emotional state in at least some way. It would explain the somewhat significant difference of the power released by his quasi-sonic scream. While at in a calm state, a simple whisper from Black Bolt has destroyed entire mountain ranges and cities in seconds in the past, but while under more strenuous circumstances, it was stated that a single syllable would be capable of annihilating more than half a planet. The full extent and damage of Black Bolt's scream is unknown, but based on the fact that it is caused by particle interaction and electron manipulation, it is theoretically infinite. He has shown in a what if to be able destroy both the Sentry and the Sorcerer Supreme Doctor Strange with one sound wave on a parallel Earth as well as use his vast powers to rip a hole in reality to retrieve the Reality Gem shocking Iron Man with his power, and even make cosmic beings like Vortex nervous. With one word, Black Bolt powered the entire city of Attilan to move at a much faster than light speed and destroy Skrull ships. At the end of War of Kings. One yell from Black Bolt came close to overloading the T-bomb that sent a shockwave that devastated the Shi'ar fleet and tore a hole in the fabric of space and time that stretched parsecs apart. Particle & Electron Channeling: Black Bolt wears a metallic, fork-shaped antenna upon his brow that allows him to focus and channel his powers in more directed and less destructive ways. This antenna monitor's the speech center of his brain and allows him to direct quantities of the unknown particles to create controlled phenomena, such as enhancing his physical strength beyond his normal limits. He can also channel all the available energy he has into one arm for a single, massively powerful punch called the Master Blow. According to the Thing the Master Blow can hit as hard as the Hulk well Medusa has said that it could shatter the Hulk’s bones. The exertion from this, however, taxes his ability to employ the energy to its full power for a short time. Particle & Electron Manipulation: Black Bolt can also direct the unknown particle outwards without the use of his vocal chords. He can route the particles through his arms and create small yet vastly powerful blasts of concussive force. He can also form a field of highly active electrons around his body with a wave of his hand, and create broadcast jamming frequencies. This field can deflect projectiles like the mass of a large meteor. Black Bolt can also create enough iteration between the electron and particle energies to generate fields solid enough for him to travel over, cause every electron in a person’s body to collide with every adjacent electron, deactivate a missile, and draw enough elections in his body to power Attilan for ten millennia from the Earth‘s atmosphere. Black Bolt’s control of particle and electrons is so great that he has managed to hold his own against the omega level mutant Vulcan, who according to Charles Xavier is one of the most powerful mutant he has seen, for an extended period of time. Matter & Energy Manipulation: Through an unknown method, Black Bolt has shown numerous times that he has the ability to manipulate matter and energy to an unknown degree. He has shown the ability to transmute the elements, turn water into ice, cause the sea to part, hardened air molecules to rise Gorgon, Karnak, Medusa into the air, making the air too thin to breathe, holding the air in a space ship with a hole till he meted the ships walls in to place of it, grab energy with his hands and get rid of it by using a electron blast, and create multiple toys out of thin air as nothing but a mere baby by re-arranging the molecular structure. He has destroyed a Solar Flare powerful enough to annihilate the Earth, created black holes, and was able to block the powers of superhumans through his abilities and in turn denied them the access to their abilities. Telepathy: Black Bolt has incredibly powerful telepathic abilities as evident when he was able to easily resist the mental abilities of his powerful brother, and on different occasions, use his own abilities to overpower and take control over Maximus' mind. Black Bolt’s telepathy may be part of his ability to manipulate energy including the electrical impulses of a person mind by altering the electrons in the brain, like Magneto. Anti-Gravitational Flight: Black Bolt can also harness the unknown particles his brain generates to interact with electrons to create anti-gravitons that enable him to defy gravity. By emitting a jet of rapidly moving particle / electron interaction by-product while enveloped by anti-gravitons, Black Bolt has been shown to fly faster than a 1000 miles per hour for a period of 10 hours, to fly beyond escape velocity, and keep up with Nova, the human rocket who can fly at speeds above light allowing him to travel through space. The anti-graviton field also serves to protect Black Bolt from the detrimental effects of rapid movement through the atmosphere although it's not needed. Inhuman Physiology: Like all Inhumans, Black Bolt's natural physiology grants him a number of superhuman physical attributes but because of the genetic tampering at birth, Black Bolt's physical abilities are significantly superior to the other members of his race. Superhuman Strength: Black Bolt, like all Inhumans, is superhumanly strong. According to his bio, under normal circumstances, he is able to lift about 1 ton. However, he can augment his physical strength by channeling the necessary particle energy through his body. At his peak, he is able to lift up to 75 tons. However, he has been observed matching opponents as physically strong as Thor and Gladiator in hand-to-hand combat, and even appeared to be capable of overpowering the latter. This would suggest that, at his peak, he is capable of lifting far over 100 tons. Superhuman Speed: Black Bolt can run and move at speeds that are beyond the natural physical limits of the finest human athlete, as he has been able to catch directed miniature missiles even when attacked from below and unaware with ease, move at a speed so great he is invisible to the human eye, move at such a speed he can travel vast distances before a human being can finish processing a thought, and has been able to catch and beat Quicksilver with ease. He can augment his speed to a higher superhuman level. Superhuman Stamina: Black Bolt's Inhuman musculature generates less fatigue toxins than the musculature of the finest human, or even Inhuman athlete. At his peak, he can exert himself for several days before the build up of fatigue toxins in his blood begins to impair him. He can augment his stamina to unknown as well as his other physical abilities with his powers. Superhuman Reflexes: Black Bolt's reflexes are beyond those of the finest human athlete, such as easily dodging a series of blows by the Thing, catching a tank shell bare-handed, or to the point where he managed to evade the Human Torch, and he can augment his reflexes to unknown levels. Superhuman Agility: Black Bolt's agility, balance, and bodily coordination are enhanced to levels that are beyond the natural physical limits of the finest human athlete. He has shown inhuman and amazing maneuverability and agility in the air, capable enough of combating numerous air crafts, and dodging various projectiles from multiple directions. Black Bolt can augment his agility to unknown levels. Superhuman Durability: Black Bolt's body is incredibly resistant to all forms of physical damage. Black Bolt is resistant to great impact forces, such as falling from a height of several stories that would severely injure or kill a human being unharmed. He has been repeatedly struck by beings with vast superhuman strength such as the Thing, the Hulk, Namor, Gladiator, Thor etc. and remained unharmed. Black Bolt is capable of withstanding extreme temperatures, such as the cold in space without any discomfort, the heat from re-entry without any discomfort, and even the heat from a Solar Flare powerful enough to significantly damage the planet without any damage at all. Black Bolt can augment his durability to unknown limits. Superhuman Longevity: Like all Inhumans, Black Bolt has a natural lifespan that is at least twice the average lifespan of a human being around 150 years of age. Black Bolt is able to communicate non-verbally, although Medusa often will act as a translator for him. Leadership: Black Bolt is a brilliant scientist and strategist, has led the Inhuman race for a long time and outsmarted his genius brother Maximus. Formidable Opponent: Black Bolt is a master martial artist being able to beat Ikaris in hand to hand combat, although the slightest sound, even the smallest sigh directed towards most all individuals, even those possessing great physical attributes, is enough to destroy them. Black Bolt has shown to be a skilled swordsman defeating Ronan the Accuser in a sword fight. Indomitable Will: Every night, Black Bolt meditates for an hour before he goes to sleep. With sheer effort of will, he purge all his thought of the day from his mind. Pushing away every thing he has seen and heard, and even the emotions of his memories in order not to make a sound when he sleeps. Karnak has said that he can’t find a weaknesses in Black Bolt. @humanrocket: @wolverine08: @green_skaar: hey can u guys tell some good stories with black bolt i am interested in him since I began to read the new inhumans series like when did he die and crash his flying city and has lash been in the comics before. The Inhumans by Paul Jenkins and Jae Lee is an incredible work. Told in 12 issues, the story takes a bit of time to unfold and new readers will need a while to familiarize themselves with all of the characters. But once these two areas are handled...get ready for a fun ride. It's impossible to describe the depth of this story. What other writers would present as a simple battle between government soldiers and a race of super-powered beings...Paul Jenkins pulls so much more from. There is slavery, penance, insanity, forgiveness, shame, understanding, heroism, loyalty, blind loyalty, manipulation, emancipation, love, and then there is family. What makes The Inhumans work so well beyond the immense story is the uniqueness of the characters. The race of inhumans each have their own individuality expressed in their dialogue, their actions, and most powerfully in their appearence. Black Bolt is such a BAMF. It's a shame he isn't appreciated as much as he should. Realistically he should be in Marvel's top 5 strongest heroes. Too bad, maybe one day..
@humanrocket: Sir, one more outburst like that and I will strangle you with your own spandex. @humanrocket: Yes, you can scream like a girl. Very impressive. 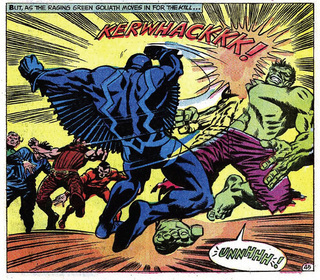 Pfffffft, Hulk no like Black Bolt punch to face, Black Bolt stronger than Hulk. @humanrocket: Ha, PIS. Nothing beats Hulk. This is almost as bad as the Hulk: Agents of Smash episode where Black bolt appears. One of the most underrated Marvel Character.Nice to see a respect Thread for him. @ostyo: Everyone beats Hulk, where have you been little turtle? @humanrocket: Woah, that's Star-Turtle to you. @ostyo: More like Star- Koopa no?